This pump tank system is the revolutionary new design for pump tank systems, merging the non ferrous features of our patented polyethylene reservoir with the standard Temptek pumping system. Offered for Tower and Chillers water systems. Tower systems are accommodated to 1000 tons and chilled water systems up to 600 tons. All types of industrial applications can benefit from using the PPT Series pump tank station for plant wide water distribution. These include most Plastic molding processes, Diecasting, Dry Cleaning, Food Service and others. 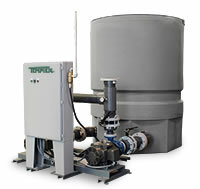 System are offered in capacities from 400 to 3000 gallon capacities. (2 pumps) Depth : 126"
(3 pumps) Depth : 133"
3. Typical process pumps are shown. Several HP ranges can be used on this unit. However, the most typical are displayed here for reference. Consult the factory for specific HP and GPM requirements.